After many years, approximately ten... I finally talked my husband into building a deck. We don't go on vacations, so I wanted to invest our money in our backyard. There was a cement landing with steps prior to the deck, but it was way too small for even one chair. Having my patio set in the grass made my legs crawl...literally! I wanted a simple deck with easy lines so, I drew this out on graph paper and showed all my friends what I was dreaming of. And now it's finally here and I adore it! The one thing special is.. there are no railings. Nothing to sweep around, shovel around, or paint and stain. That's the beauty of my design! My husband isn't a carpenter, so we had a friend figure it out. I showed him my idea and he had a little trouble with the circular corners but finally did a hex shape support for the bottom step. The top corners were just mitered. You can put furniture everywhere and nothing is in the way! Winter in New York is great for just shoveling the whole thing off. Best of luck to you, it is a very inexpensive plan! I really like your deck. It's similar to what I want to do. Did your family build it themselves, or did you hire someone? 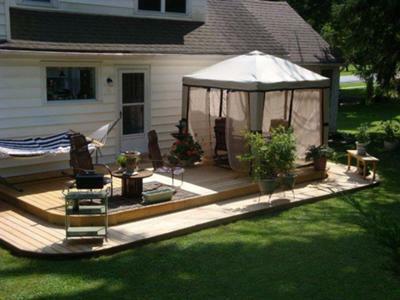 There is something very inviting to this deck. It's so simple in one sense but seems so perfect for your backyard. I really like it. 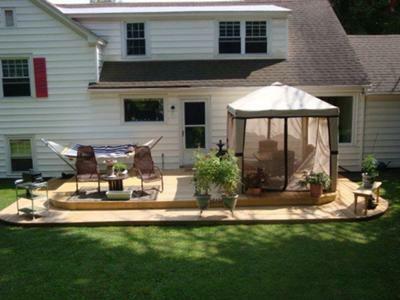 Just looks like a great natural extension of your home and great place hang out with family and friends. Well done.